​Situated in the Rhône-Alpes in southeastern France, the Northern Rhone section of the Rhone Valley region produces some of the world’s most legendary Syrah wines. The vineyards of the Northern Rhone follow the north-to-south route of the Rhone River from Lyon down to around Valence. These vineyards were most likely planted around 500-600 B.C., and were producing copious amounts of wine under the Romans, and then even more so in the 13th century when the Popes temporarily relocated to Avignon. In a demonstration of the commercial power of the Catholic Church at that time, the Rhone wines began to give Burgundy a run for its money, so much so that the Duke of Burgundy temporarily forbade the import/export of Rhone wines. Of the two parts of the Rhone Valley, the Northern part is geographically smaller (only 2,836 hectares planted on about a 90km stretch), responsible for less than 5% of the Rhone’s total production and, for many connoisseurs, considered to be the more quality-focused part of the region. From these storied vineyards with prestigious names like Côte Rôtie and Hermitage come some of the most sought after wines in the world. And while the Syrah grape may not have originated here (there is a debate about its origin), what is not up for debate is that this late ripening grape thrives in the Northern Rhone’s cooler continental climate and steep hillside terroir. In fact, Syrah is the only red grape permitted in the AOPs of the region. These AOPs are: Côte Rôtie (where, uniquely, a small percentage of Viognier is usually blended in to the red wines), Condrieu (the famous, tiny Viognier-only appellation next to Côte Rôtie), Château Grillet (a Viognier-only monopole appellation), Saint-Joseph, Crozes-Hermitage, Hermitage, Cornas and Saint-Péray (an all white appellation that also makes some sparkling wine). The only other permitted grapes (for white wines or in some cases for blending in small percentages into the reds) are Viognier, Marsanne and Roussanne. Because of the minuscule production of most producers here, the Northern Rhone was little known to the wine world until around the mid-1980s. At that time certain dedicated, tireless producers (foremost among them Etienne Guigal and J.L. Chave) began to travel and get the word out about these world-class wines. With the help of their international importers and some adoring US wine critics, they succeeded in creating the mystique and popularity surrounding these wines today. We are fortunate to have (fairly early on) discovered a small group of Northern Rhone growers whose wines embody the unique spirit of the region, yet still offer great value—a rarity in the region. We will now take you on a tour of these domaines from north to south. This more recent appellation created only in 1984 is the northernmost, and thus coolest, in the Northern Rhone. Situated in the hillsides (coteaux) west of the city of Lyon, the vineyards’ proximity to Beaujolais heavily influences the permitted grapes (Gamay for the reds, Chardonnay and Aligoté for the whites) and winemaking style (mostly carbonic maceration as in Beaujolais). The appellation’s co-operative is responsible for about half the production of Coteaux du Lyonnais, and the remaining small producers mainly sell their wines to thirsty locals. Our producer Guilhaume Clusel, son of Brigitte Roch and Gilbert Clusel of Clusel-Roch, makes small amounts of deliciously fresh wines from organically-grown Gamay. This tiny appellation (only around 200 hectares of vines) gives us some of the most sought after, elegant, unique wines in the world. Unfortunately their prices tend to match this reputation, but most lovers of Northern Rhone wines agree it is worth it! The two principal roasted slopes (côte rôtie) of the appellation name are the Côte Blonde and the Côte Brune, where most of the most famous vineyards are located. These names are apt—the soil of the Côte Blonde is visibly “blonder”, as a result of its sandy granite and schist, while that of the Côte Brune (“Brown”) is visibly darker because of its combination of schist, mica and iron. 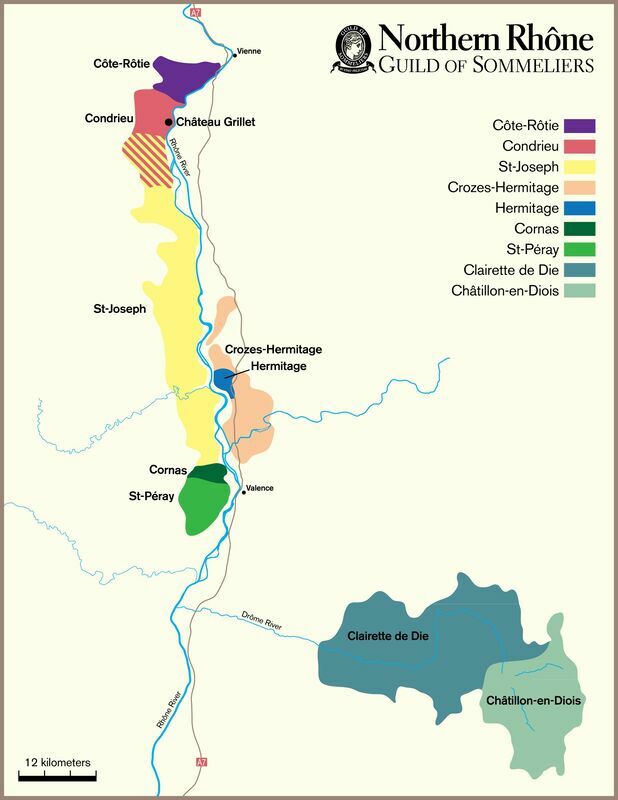 While small percentages of white grapes may be blended into all the red wine AOPs of the Northern Rhone, Côte-Rôtie is the only one to consistently do so, with a majority of the producers blending in up to 20% of Viognier. A truly special appellation, Condrieu allows only the white grape Viognier in the production of its wines. The vineyards, located on one of the “S” curves of the Rhone River, sit on south and southeast-facing steep granite slopes. Receiving so much sunlight, the grapes ripen well and create more full-flavored wines. These wines are given balance and minerality by the vineyards’ topsoils of chalk, flint and mica, making them excellent partners for the region’s goat cheese and other specialties. Luckily for us, Condrieu was saved from imminent extinction in the early 1980s when vineyards had dwindled down to less than a hectare. We can thank producers like Guigal and Chapoutier for their tireless efforts to preserve this jewel of an appellation. Our famed Côte-Rôtie and Condrieu producer, Domaine Clusel-Roch Côte Rôtie, is a husband-wife team helped by their son Guilhaume to organically farm their scant 3.5 hectares in Côte Rôtie and ½ a hectare in Condrieu. The Côte-Rôtie hectares include a tiny parcel on the world famous vineyard Les Grandes Places. Many of these vines are very old, and each year we look forward to the arrival of their Condrieu, Côte-Rôtie Classique, Côte-Rôtie Viallière, and Côte-Rôtie Les Grandes Places. Sometimes confused with its (much more expensive and storied) neighbor Hermitage, this area’s wine production dates back to the 1700s, when there are records of exports to England. The AOP was not officially created until 1937. Today it is the second-largest appellation in the Northern Rhone, with over 1,000 hectares across 11 communes. Here the terroir is made up of both slopes and plains, with some red clay and some more stony soils depending on the specific area. Most of the vineyards are climatically influenced by the two rivers (Isere and Rhone) that run through the AOP. The vast majority of the wine made here is red, from Syrah, but the few whites are made from Marsanne and Roussanne. And many of the wines are considered to be the rare value-priced wines in a sea of high-priced ones. Our Crozes-Hermitage producer, Domaine Combier, is a perfect example. Originally only a property of organic fruit orchards in Pont de l’Isere, the domaine’s vineyards are still farmed organically and wines are made in a highly traditional manner. Current propietor Laurent Combier handcrafts his Crozes-Hermitage AOP, Crozes-Hermitage Cuvée Laurent Combier, Crozes-Hermitage Cap Nord, and Crozes-Hermitage Clos des Grives from these vineyards, as well as a Saint-Joseph Cap Nord from a small parcel of vines he owns in that neighboring appellation.